We are publishing recommendations for every local authority area over the course of the next fortnight (in alphabetical order), along with the details you need to know to plan your visit. Get motoring! Huntington Castle was home to the Esmonde family who came to Ireland in 1192. Within the 160 acres of gardens, woodland and farmland the castle here features a guided tour that focuses on 17th-century history. On the guided tour visitors can see the Temple of the Goddess located in the castle dungeons, as well as a sacred well of St Brigid. Amenities: There is a children’s playground, tea rooms and gift shop. Wheelchair access is limited to certain areas of the garden only. Opening hours and costs: The castle grounds are open from 11am-6pm daily with tours on the hour from 2pm onwards. Entry to the house and gardens costs €9 for adults and €4 for children with family and group discounts available. Weavers Cottages were built by Alexander Durdin in the late 17th century and weavers lived here at the height of the trade. Within the cottage today there are items, artefacts, furniture and pictures from bygone times as well as a heritage garden. Amenities: There is no access to wheelchair users and there are toilet facilities. Opening hours and costs: The cottage is FREE to visit, open Monday to Friday 9am-5pm and 12-4pm on weekends. Donations are welcome. There are four interactive exhibition galleries which feature 1916 stained glass windows, archeology of the Carlow bypass and the story of St Willibrord. The museum houses the carved pulpit which is over 20 foot tall and made entirely of oak, as well as the original gallows trapdoor from the Carlow Gaol used during the 19th century for public executions. Guided tours can be booked online in advance. Amenities: There are toilet facilities, a car park as well as full wheelchair access. Opening hours and costs: The museum is FREE to visit and open daily from 10am-5pm and on Sundays/bank holidays 2-4.30pm. 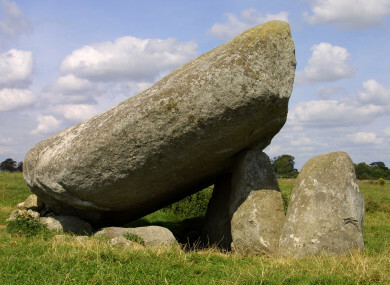 This monument dates back to 2500BC and is believed to be the largest dolmen in Europe. Weighing over 100 tonnes, it would have been used as a burial site. Visitors can see the granite capstone resting on two portal stones which flank a door stone and slope down to reveal a low boulder. Amenities: There is a nearby car park and wheelchair access to the site. At the banks of the river Barrow, the St Mullins heritage centre is situated in the monastic ruins and cemetery originally built in 1811. All aspects of local history are covered in the exhibition on site including publications, church records, maps, old photographs and artefacts. The exhibition also covers the 1798 rebellion, the river Barrow and the importance of local flour milling. Amenities: There is no access to wheelchair users or any toilet facilities available. Opening hours and costs: Entry is €2 for adults while children go free. The centre is open daily Monday, Tuesday, Wednesday, Friday 12-5pm, Thursday and Sunday 2pm-5pm and Saturday 1pm-5.30pm. Thanks to Carlow County Council heritage office for recommendations. LATER: This evening’s we’ll bring you the Top 5 must-sees in Cavan, while tomorrow it will be the turn of Clare and Cork. Email “Your summer in Ireland: 5 must-see sites in Carlow”. Feedback on “Your summer in Ireland: 5 must-see sites in Carlow”.